The attention of Federal Road Safety Corps has been drawn to media statement about a fatal road crash, where eighteen passengers were reported to have died. The crash actually led to the death of seven people and occurred on Sunday along Lagos- Ibadan expressway at SANCRETE at about 1650hrs. The crash involved a Ford explorer SUV with Registration number KJA 278DS and Mazda E2200 Bus(BDG 873 XU). Nineteen people where involved in the crash, (11 male adult, 7 female adult and 1 male child). 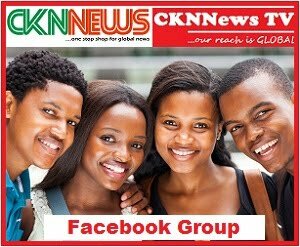 The crash claimed seven lives, ( 3 male adult, 3 female adult and 1 child) and twelve persons sustained various degrees of injuries. The dead were deposited at FOS ISHARA and the injured victims taken to Idera hospital at Sagamu by the men of Federal Road safety Corps. The crash was a result of suspected tyre burst and speeding. The crash occurred at Sancrete within the portion of the road where RCC, the construction company rehabilitating the road diverted traffic on the five kilometers stretch of road from Sanceret to Fidiwo to enable them rehabilitate the weakened bridges which necessitated the diversion of traffic, since December 2017. 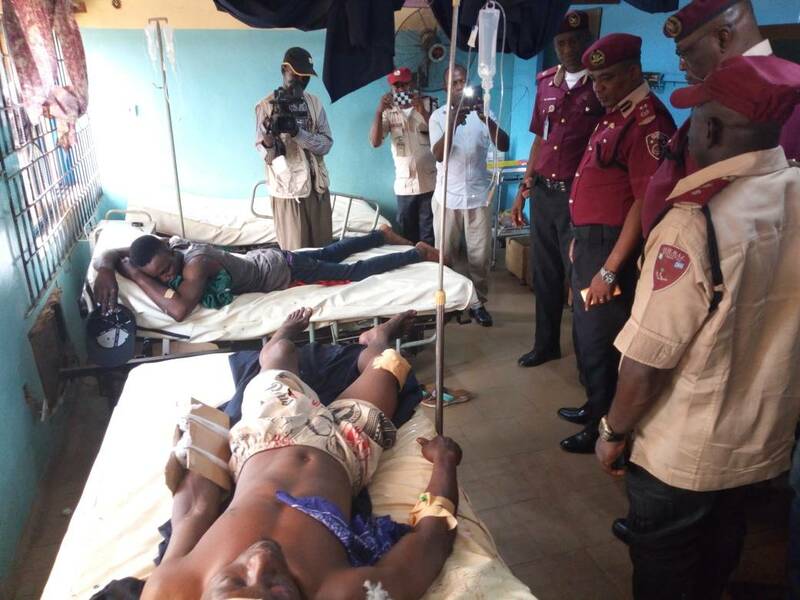 A hospital follow up visit, in line with WHO thirty-day rule, by the FRSC team led by the Ogun State Sector Commander, Corps Commander Clement Oladele to Idera hospital Sagamu where some of the victims are currently receiving treatment. 7.KHADIJAT QADRI and Mr FRANCIS who confirmed that his bus driver was speeding and suddenly the tyre burst, which made the vehicle to veered off and eventually collided with the Ford Explorer travelling in opposite direction as all traffic were diverted to one section by the construction company. 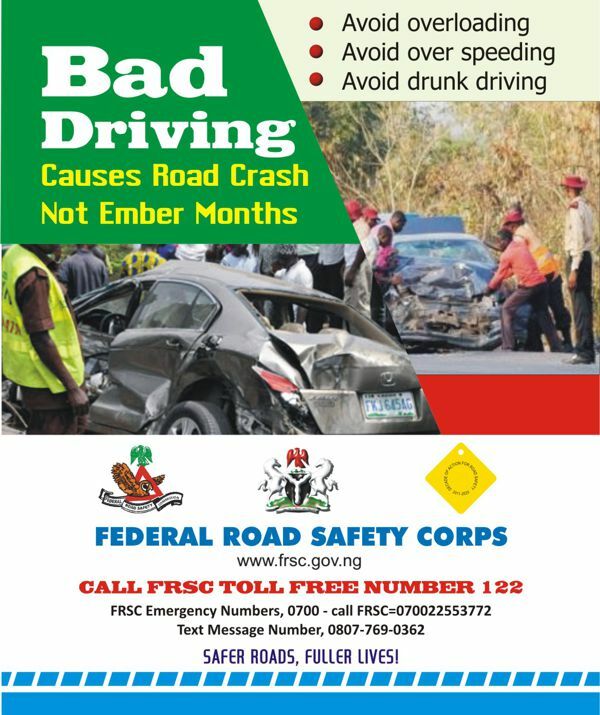 Preliminary investigation by the FRSC accident investigation team revealed that the burst tyre of the commercial bus had expired and the bus was not fitted with speed limiting device at the time of the crash. In addition there was no record of drivers license and passengers manifest in the commercial bus . The tyre examination of the two vehicles are as follows. FORD EXPLORER. Front left was manufactured week 35 of year 2017 (3517) RADAR . Front right (4011) MICHELIN. Rear left (3211) BRIDGESTONE. Rear right (3215) RADAR. The Mazda Bus tyre are front left (3917) TORQUE. Front right (4017) TORQUE. Rear left (turn inside out) MICHELINE. Rear right (turn inside out) MICHELINE.